I don’t have a router table (yet), but needed to do some patterned edges for my Walnut Dining Table with a massive Whiteside 1480 oval edge bit fitted with a guide bearing. 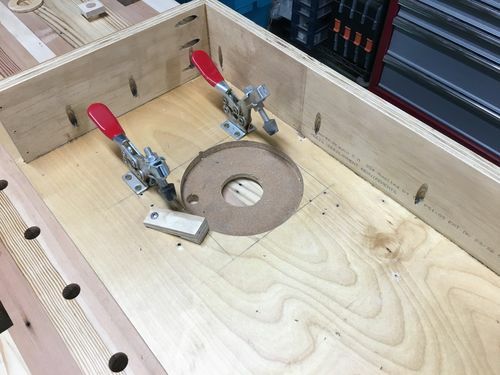 I eventually want to get a router table, but really did not want to spend the money or build one quite yet. 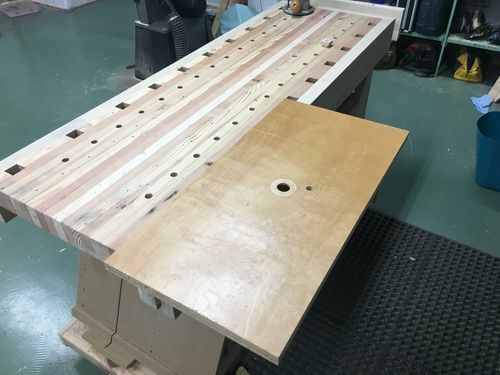 I thought about picking up a cheap benchtop model, but the tops just were not quite big enough for what I needed and they would sit too high for pattern routing safely. 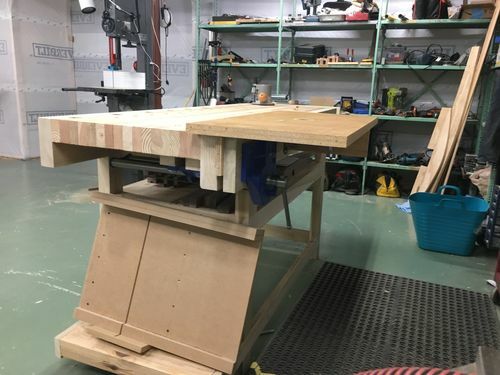 So, I built my own extremely simple vice mounted router table top with just enough features for this project. It is something I could easily expand if I need more out of it later. There are quite a few ides for this concept online, but most were a bit more than I needed, so I ended up going very simple and just used some scrap maple laminated MDF left over from my old kitchen cabinet sides I had kept, but never used. Essentially I wanted to mount my router for use with a guide bearing and have access from the top for adjusting the bit height. It needed to be able to be assembled and broken down quickly and stored easily. Here you can see a glimpse into Part 3 of the table series. I first cut off two sides of a 3/4” maple laminate MDF cabinet from my recent kitchen demolition. 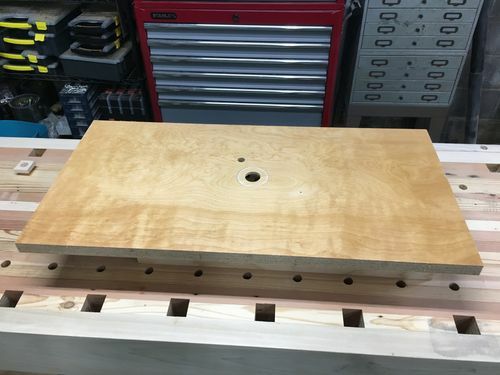 I used a router circle jig to cut out a round hole the size of the router base (with a snug fit) in one side, then a smaller 1-1/2” hole in other side. I then glued these together into a 1-1/2” thick top. Rough dimensions were 24” x 32” after trimming off the stapled edges from where it was assembled in its previous life as a kitchen cabinet. 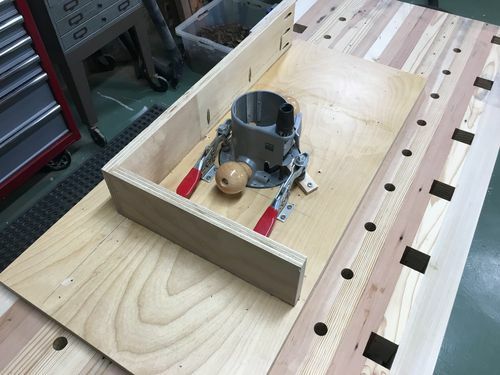 The under side of the base cutout was lined with some cork gasket material and I used some jig clamps to hold down the router base and still allow for quick assembly. An “L” shaped base was pocket screwed into place to support the top and allow for a place to mount the makeshift table in the front bench vice of my workbench. I could then route out a 2” diameter recess in the top to hold a removable plate and bored another hole to access the height adjustment screw in the router. The assembly just mounts solidly in the front vice and allows for some simple pattern routing needed for the table. You will be able to see more on this in the Part 3 of the Walnut Dining Table blog. While I had done a lot of house remodling and other more carpentry related work in my past, I always wanted to do more real woodworking (furniture, etc. ), so in 2017 I started building out a small workshop in my basement. 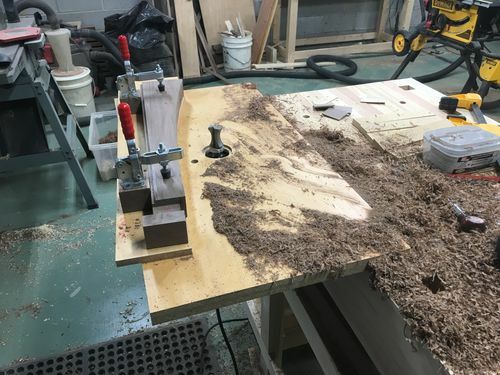 This is a blog of my adventures and attempts at woodworking. This is mostly for myself and tracking my progress, but maybe others will get something out of this (at least out of my mistakes). Good call. Sometimes the simplest solution is the best. I was wondering how you were going to shape those legs. It didn’t occur to me that you could find a router bit for that job! Here is a tip for dust collection that I use when pattern routing: Hang your dust collection hose from the ceiling, about 2 inches or a little less, above the bit. I have done this for quite a while now, and it really gets most of the chips, and leaves little mess. Just make sure the hose (mine is 4” by the way) cannot run into your cutter.